Lava from the Kilauea volcano approaches the Puna Geothermal Venture plant on Hawaii's Big Island on Monday. 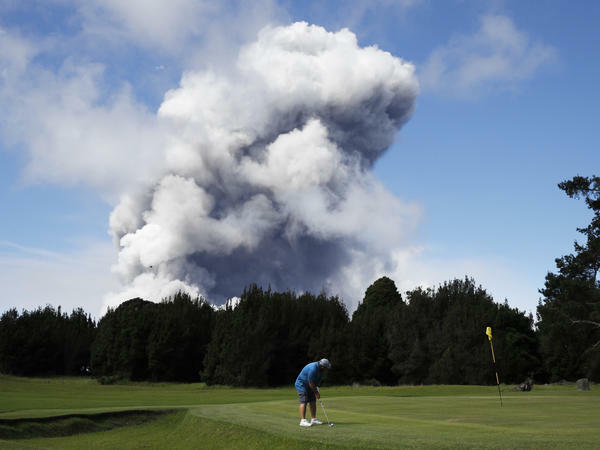 A golfer makes the best of the situation as a huge ash plume rises from Kilauea's summit nearby on Monday. In the weeks since the Kilauea volcano began belching lava into Hawaii's residential areas, the fiery flow has destroyed dozens of structures and covered scores of acres on the Big Island. But authorities fear its destructive reach could ravage at least two more cornerstones of the state: its power supply and, a little less tangibly, its all-important tourism industry. On Monday evening local time, the Hawaii County Civil Defense agency announced that lava from nearby fissures had begun to encroach on the southern edge of a significant source of the Big Island's power, the Puna Geothermal Venture. The plant harvests hot liquid and steam from underground wells to drive turbine generators for electricity, which is then sold to the state's utility. Another risk, besides the loss of power, rests in what might happen if the lava overcomes the state's protective measures: "There's a steam release, there's many chemicals, but primarily the critical factor would be hydrogen sulfide, a very deadly gas," Hawaii's Emergency Management Agency chief, Tom Travis, told reporters Monday night. "County, state, and federal partners have been collaborating closely to monitor the situation and work with PGV to ensure the safety of the surrounding communities," the civil defense agency said in its alert. "Ten of the eleven wells have been quenched. Efforts are ongoing to make sure the site is secure and the community is kept safe." When officials refer to "quenching," Travis explained, they mean "filling [the wells] full of cold water so that the weight of the cold water sitting in the pipe, the long pipe, is sufficient that instead of hot water entering the bottom of the well, cold water exits the bottom of the well." It is the second step after simply shutting all the wells, which he says they already did when the event began. Crews were working overnight to quench the 11th and final well. 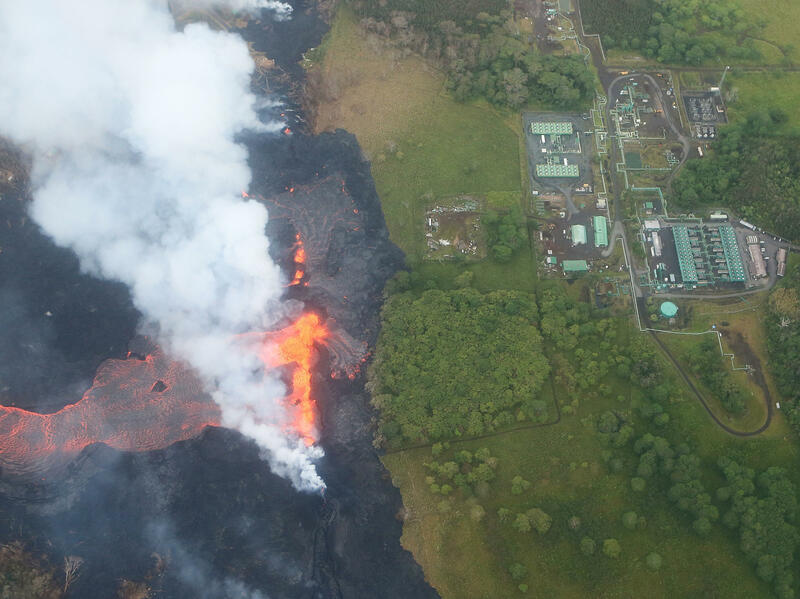 "Once that step is taken, we will be in a much more solid state for having lava overflow the site," Travis added late Monday. "It's not easy to predict where it's going to go and when it's going to get there. So it's important that we get what we can done now." Meanwhile, elsewhere on the island, the longer the lava keeps flowing, the longer one of the state's premier tourist attractions remains closed to ensure visitors' safety. About two-thirds of Hawaii's Volcanoes National Park closed May 11, right around the start of the summer tourist season — and it remains closed, likely deterring a substantial chunk of the park's more than 2 million annual visitors. A National Park Service report published last month estimated that those visitors spent $166 million in communities nearby last year — spending that "supported 2,020 jobs in the local area, and had a cumulative benefit to the local economy of $222,394,900." The number of visitors to the park has "increased by 58 percent" since an eruption on Kilauea's summit a decade ago, according to the NPS. Now that Kilauea's activity has dramatically escalated, however, local businesses have seen their income diminish in seemingly equal proportion. "We have a family to support so we hope that the national park will reopen again soon," one small-business owner told Reuters, "otherwise this could have a serious impact on our life."